Thanks for your support, RM & Dahlia! I am going to take your advice and not worry about it. I am not really experiencing a lot of hunger - here and there but nothing that would indicate I'm really depriving myself. Yes, it makes sense that all the nutrient dense foods I'm consuming would reduce my need for calories - quality over quantity! I'm reading a book about that very subject right now! Dahlia, I am feeling you. I very well may abandon my birthday meal plans. I used to make raw food desserts and, I think that might be my "birthday cake" this year. I will post some recipes as I make them again. For now I will post the green soup I've been eating which I just love. So glad you are doing well Anna. Having a raw food birthday cake sounds very interesting. Please share recipe. Thanks Dahlia. This is a great article, and printed it out for future reference. It is a good reminder of the science behind weight loss, and how to maintain that weight loss. Today I made a delicious Seaweed Salad, and it is a keeper recipe. It is loaded with nutrients like fiber, vitamins, and minerals. Ingredients are: 30 grams (1 ounce) dry mixed seaweed, 1 tablespoon + 1 teaspoon rice vinegar, 1 tablespoon toasted sesame oil, 1 tablespoon soy sauce, 1 tablespoon sugar or agave, 1/2 teaspoon salt, 1/2 teaspoon ginger juice, 1 tablespoon toasted sesame seeds, 1 scallion, finely chopped. Directions are: Put the dry seaweed in a large bowl and fill it with cold water. If you like your seaweed crunchy, soak it for 5 minutes, if you like it more tender, soak it for 10 minutes. To make the dressing, combine the rice vinegar, sesame oil, soy sauce, sugar, salt and ginger juice in a small bowl and whisk together. Drain the seaweed and use your hands to squeeze out excess water. 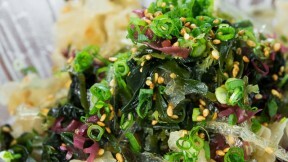 Wipe out any excess water in the bowl, and then return the seaweed along with the dressing and sesame seeds. Toss thoroughly to combine. Plate the salad and garnish with scallions. I happen to have seaweed, lots of it, it was a gift, thanks for the recipe. Happy Saturday Healthy Friends! This Monday, May 27th, is a special holiday in the U.S. called Memorial Day. It is observed on the last Monday of May, and honors the men and women who died while serving the U.S. military. Originally known as Decoration Day, it originated in the years following the Civil War and became an official federal holiday in 1971. Many Americans observe Memorial Day by visiting cemeteries or memorials, participating in patriotic parades, and family gatherings. In honor of my family and extended family who served in the military, I want to say thank you for your service to keep us safe. I have just completed my 4th week of the 5-week juice fast, and I have lost 15.6 pounds so far and a total of 9.75 inches across 6 measurements so far. I now have slightly less than 10 pounds left to lose with one more week to go. You Go Girlllllllllll........ You can do this. Congrats on four amazing juice filled weeks. Thanks, RM. I won't lose all ten pounds in one week, but it will be a good start. If i remember correctly, after the previous juice fast, you continued to drop weight after you stopped juicing, so your goal is within reach. Way to go, Shari! I did lose weight afterward because I was mostly eating one meal a day of a large salad for lunch at work. I was still having two juices a day at that time with the large salad for lunch, then broth in the evening. I don't want to have to do something that drastic this time since I have less to lose now. I also ended up gaining almost 2 pounds back yesterday, so that was a step backward. I'll keep at it and hope for the best the remainder of the juice fast. Woo hooooooo, Shari!!!!!!! Just think of your cells filled with all that amazing healthy food! I found a wonderful summary of health flour substitutions for those of you who want to try healthier formulas in your cooking. If you try them, let me know how they work for you. Enjoy. ALL-PURPOSE FLOUR BLEND: Use this blend for all of your gluten-free baking. ½ cup rice flour, ¼ cup tapioca starch/flour, ¼ cup cornstarch or potato starch. HIGH-FIBER FLOUR BLEND: This high-fiber blend works well for breads, pancakes, snack bars, and cookies that contain chocolate, warm spices, raisins, or other fruits. It is not well-suited for delicately flavored recipes, such as sugar cookies, crepes, cream puffs, birthday cakes, or cupcakes. 1 cup brown rice flour or sorghum flour, ½ cup teff flour (preferably light), ½ cup millet flour or Montina® flour, 2/3 cup tapioca starch/flour, 1/3 cup cornstarch or potato starch. SELF-RAISING FLOUR BLEND: Use this blend for muffins, scones, cakes, cupcakes, or any recipe that uses baking powder for leavening. 1 1/4 cups white sorghum flour, 1 1/4 cups white rice flour, 1/2 cup tapioca starch/flour, 2 teaspoons xanthan or guar gum, 4 teaspoons baking powder, 1/2 teaspoon sea salt. 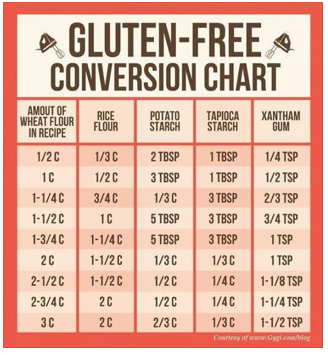 GENERAL GUIDELINES FOR USING XANTHAN/GUAR GUM: Gum (xanthan or guar) is the key to successful gluten-free baking. It provides the binding needed to give the baked product proper elasticity and keep it from crumbling. Add 1/2 teaspoon xanthan or guar gum per cup of flour blend to make cakes, cookies, bars, muffins, and other quick breads. Add 1 teaspoon per cup of flour blend to make yeast bread, pizza dough, or other baked items that call for yeast. If you purchase a commercial flour blend, read the ingredient list carefully. Some blends contain salt and xanthan or guar gum. If so, there is no need to add more. Happy Friday Healthy Friends! 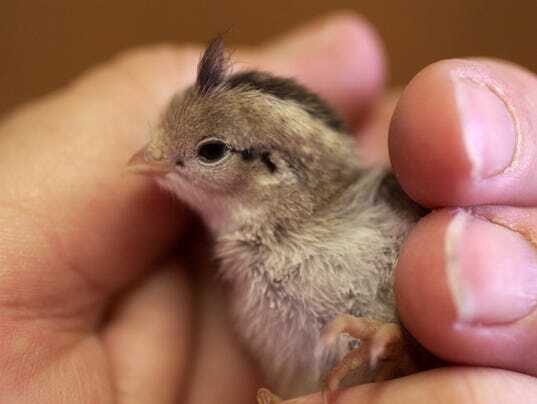 My morning got off to a unusual start when my 15 year old kitty kat (Emma) brought in to the house a little baby quail. Thank goodness I was right there, and was able to separate Emma from the baby quail quickly. I put Emma in a closed bathroom, and followed the little baby quail running through the living room and the bedroom. I was able to capture her and place in a safe cushioned container. I then walked around the neighborhood until I caught up with the momma quail and her other little baby chicks. I was able to get close enough to reunite the lost baby with her momma. Whew......what a way to start the morning. My cat was in the backyard, which is enclosed so the little baby must have squeezed under the patio gate (very small opening). Unfortunately, my cat was outside sleeping in her bed and heard the chirps. It is spring here, and all the quail eggs are hatching so I will keep Emma in for a month or two until the babies have learned how to fly. Have a great weekend everyone. Wow, honest writing really does expose your inner demons. I was just posting on my wall about Day 6 of breaking the fast, and it hit me I may have traded a habit of over-eating for a habit of under-eating. I'm finding it very difficult to get myself to increase calories because I don't want my weight loss to slow down. My birthday is coming up in 15 days, and I've got serious plans for a couple of indulgent meals. Meals that I've been planning, plotting and fantasizing about for say... only the last 100 days! I will have to summon my inner policeman to take over. I must increase calories by at least 50 each day. Otherwise, how will I eat them?! I don't know. Maybe I just need to go strong and hard until I hit my weight loss goal - which would be another 55 pounds. Maybe that's what I really want. I'm so done with being fat all my life. 40 years! Maybe I just need to get there and then, at that point, I will once again become sane? Another article states: "Although juicing doesn't actually shrink the stomach, it does temporarily eliminate the possibility to eat for comfort. The upshot of that is that you will feel satiated with less food than usual, immediately after you’re done with the cleanse. This situation can provide a big psychological boost that some people need to experience so that they can change their eating behaviors and stop sabotaging their weight loss. Hello Maddogcupcake, if i have interpreted your post correctly, you are struggling at this point between continuing with your new eating plan and going back to your old way of eating. We all have been there. Are you hungry on your current eating plan. If not then you are receiving the proper nutrition. If you are hungry, then add protein.. I note that you are following a vegetarian or vegan diet. 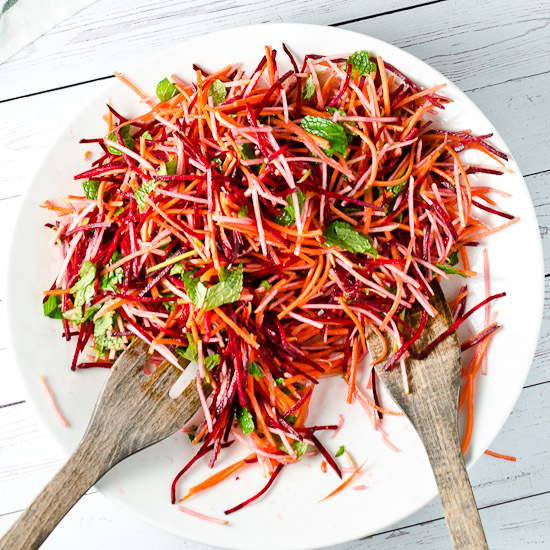 Have you tried adding 1/2 cup of beans or chickpeas, or 1 egg( if vegetarian) to your salads. I am assuming that you are adding at least one tablespoon of a healthy oil such as olive oil , or 1/4 avocado to your salads. If you are already adding protein, then increase the portions by a quarter of a cup. Are you hydrating sufficiently? Sometimes, we feel hungry, but what we need is a glass of water. Have a glass of water, wait a half an hour, then reevaluate. It is a balancing act of the right nutrition and hydration for me. Several years ago, my husband gave himself the best birthday gift, the gift of health. He stopped smoking. Perhaps a birthday celebration need not mean returning to old habits, perhaps the lesson here may be to change what a birthday celebration means. I speak to myself on this one, as this is a lesson I need to learn. Every spring, I manage to drop weight, get off sugar (my nemesis), feel healthy and alive, until my Birthday. Then I have that piece of cake, (a chocolate delight from a French pastry shop) and I am back on sugar for several months with a reduction in health and a weight gain. I am praying that this year my brain changes and I learn my birthday is a celebration of birth. I did not come into this world with cake in my hand, so why am I celebrating it with cake? Why not celebrate that first breath, with family and friends, by breathing instead. I am not sure how that will look, but maybe taking a hike and finishing by taking a big breath and a group hug at the end of the hike. Thank you Maddogcupcake for posting, as I think that in trying to speak to your post, I have had a personal breakthrough. Dahlia, your post is excellent and emotionally profound for me too. I will miss you wisdom and guidance, and look forward to your return in September. I am going to make this over the weekend! Here is an interesting article about ginger and cancer. Fantastic article. Thanks so much for sharing. One more reason for me to drink RM's ginger in warm water!